Jerrie Mock held twenty-two FAI world records, set between 1964 and 1969. 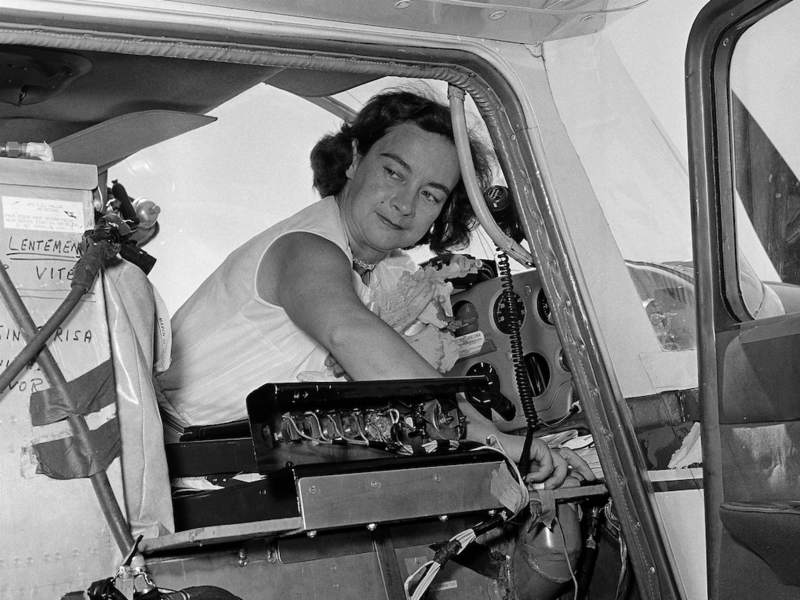 Jerrie Mock in the cockpit of her Cessna 180. 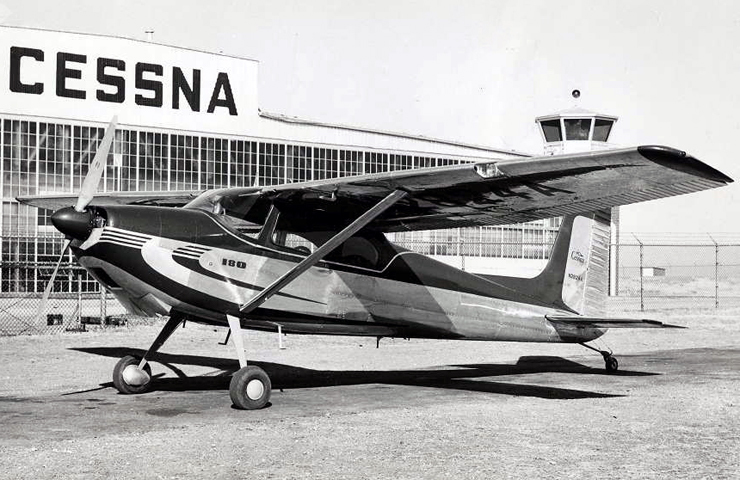 Cessna 180 serial number 30238 was built by the Cessna Aircraft Company, Inc., Wichita, Kansas, in 1953, and registered N1538C, the first year of production for the model. It was the 238th of 640 Model 180s that were built during the first year of production. 6,193 were built by the time production came to an end in 1986. N1538C was purchased for Jerrie Mock in 1963, with a total of 990 hours on the engine and airframe. The passenger seats were removed and replaced with additional fuel tanks. Additional radios and instruments were installed. The Cessna Model 180 is an all-metal, four-place, single-engine, high-wing monoplane with fixed landing gear. It is 25 feet, 6 inches (7.772 meters) long with a wingspan of 36 feet, 2 inches (11.024 meters) and height of 7 feet, 6 inches (2.286 meters). If the optional rotating beacon is installed, the height is increased to 7 feet, 9 inches (2.362 meters). 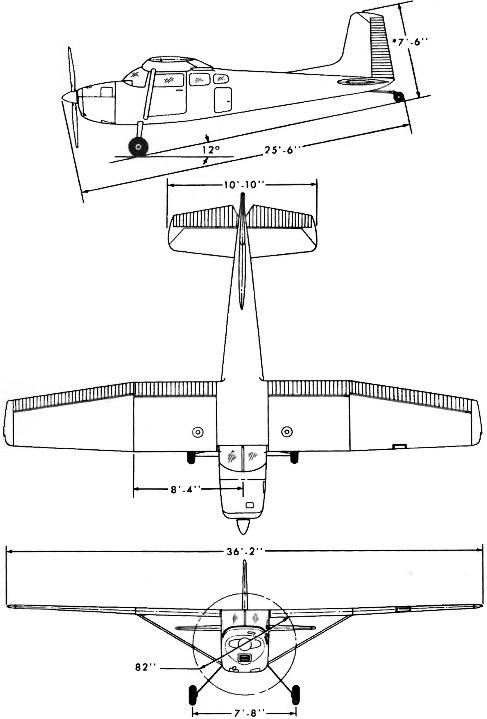 The Cessna 180 has an approximate empty weight of 1,525 pounds (692 kilograms), depending on installed equipment, and the maximum gross weight is 2,800 pounds (1,270 kilograms). 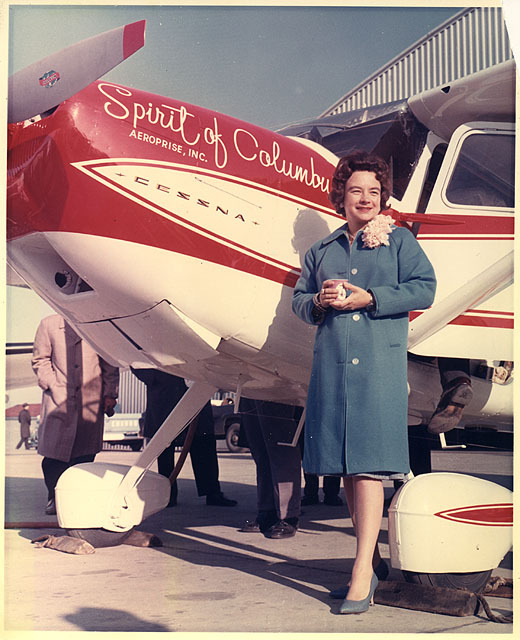 Spirit of Columbus is powered by an air-cooled, normally-aspirated 471.239-cubic-inch-displacement (7.722 liter) Continental O-470-A horizontally-opposed six-cylinder overhead valve (OHV) direct-drive engine with a compression ratio of 7:1. This engine is rated at 225 horsepower at 2,600 r.p.m., burning 80/87 aviation gasoline, and turns a two-bladed constant speed propellerwith a diameter of 6 feet, 10 inches (2.083 meters). The airplane has a cruise speed of 162 miles per hour (261 kilometers per hour) at 6,500 feet (1,981 meters), and its maximum speed is 170 miles per hour (274 kilometers per hour) at Sea Level. Its service ceiling is 19,600 feet (5,974 meters). 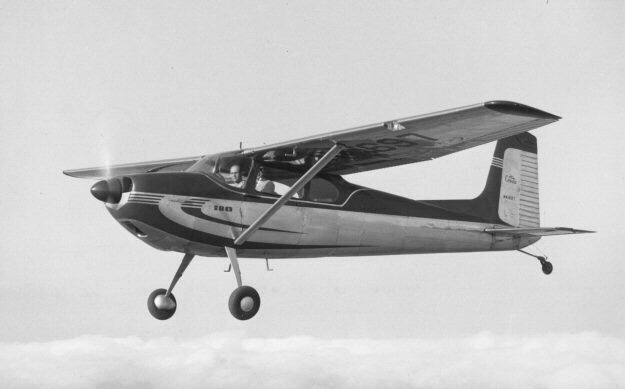 The Cessna 180 has a maximum fuel capacity of 84 gallons (318 liters), giving it an optimum range of 1,215 miles (1,955 kilometers) at 10,000 feet (3,048 meters) and 121 miles per hour (195 kilometers per hour). 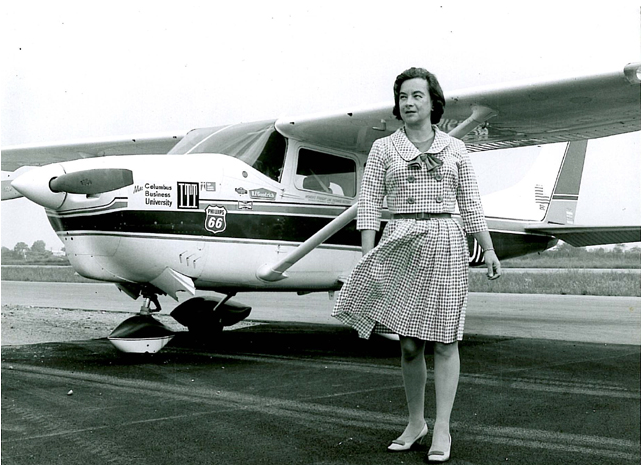 After her around the world flight, Jerrie Mock never flew Spirit of Columbus again. Cessna exchanged it for a new six-place P206 Super Skylane, N155JM. For many years N1538C was hanging over a production line at the Cessna factory. 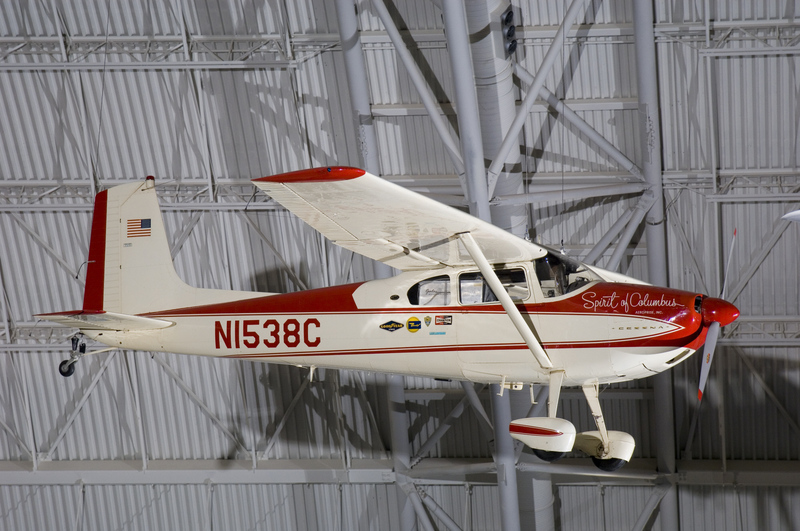 Today, Mock’s Cessna 180 is on display at the Steven F. Udvar-Hazy Center, Smithsonian Institution National Air and Space Museum. 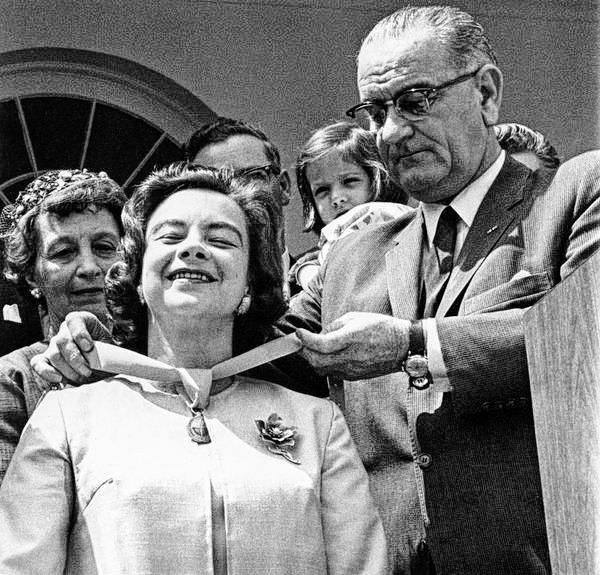 On 4 May 1964, President Lyndon B. Johnson presented Jerrie Mock with the Federal Aviation Agency Gold Medal for Distinguished Service, and the Fédération Aéronautique Internationale awarded her its Louis Blériot Silver Medal. Geraldine Lois Fredritz was born 22 November 1925 at Newark, Ohio. She was the first of three daughters of Timothy J. Fredritz, a clerk for a power company, and Blanche M. Wright Fredritz. Jerrie Fredritz graduated from Newark High School in 1943, then studied aeronautical engineering at Ohio State University, Columbus, Ohio. She was a member of the Phi Mu (ΦΜ) sorority. Miss Fredritz married Russell Charles Mock, 21 March 1945, in Cook County, Illinois. They would have three children, Valerie, Roger and Gary. 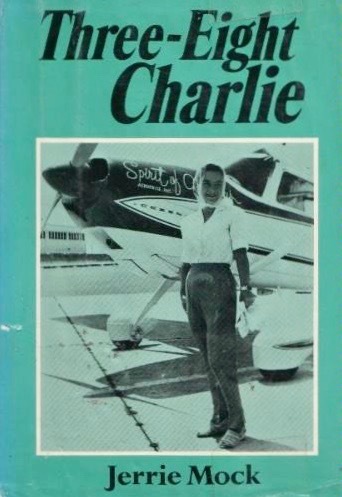 Jerrie Mock wrote about her around-the-world flight in Three Eight Charlie, published by Lippincott, Philadelphia, Pennsylvania, 1970. Geraldine Fredritz Mock died at Qunicy, Florida, Monday, 30 September 2014, at the age of 88 years. She had requested that her ashes be spread over the Gulf of Mexico.